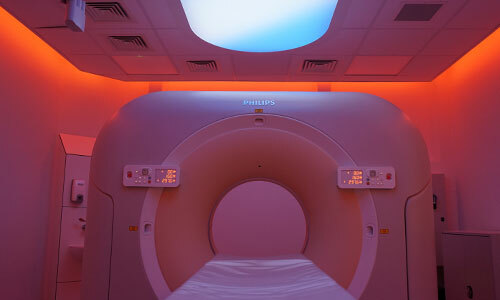 Do you need quick access to an MRI scan, CT, x-ray or breast screen? At Nuffield Health York Hospital our expert radiology team can provide you with affordable diagnostic imaging, as well as your results as quickly as possible. Why choose Nuffield Health York Hospital for your Diagnostic imaging services? At Nuffield Health York Hospital our expert radiographers are experts in diagnostic imaging and can help provide you with rapid access to an affordable scan in a relaxed, efficient and friendly hospital setting. We know that coming into hospital or having a scan can be a stressful experience at the very least, that's why our staff ensure that you are well informed and looked after throughout your hospital experience. To be eligible for a private test or scan, you will need a referral from your GP, Physiotherapist or Consultant to ensure that any of our imaging services are clinically appropriate for you. Whether you are referred for an MRI scan or ultrasound, our highly skilled radiology team will make you feel at ease with their exemplary professionalism and efficiency. You can even expect to receive detailed results from your scan within a couple of days, helping you find peace of mind or the next step in your treatment journey as quickly as possible. DEXA scan (bone density scanning). If you are in need of diagnostic imaging and want to skip the waiting lists, you can book a scan today by calling our dedicated hospital enquiry team on 01904 715 017. Alternatively, please fill out a contact form below and a member of our York enquiry team will get back to you at a more convenient time. Fill in a contact form, or give us a call to book.